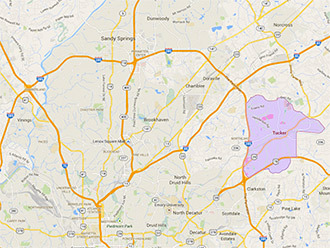 Tucker is located just outside the perimeter (I-285), between I-85 and Hwy 78 on the northeast end of Dekalb County. This is a convenient community to consider for those commuting in to the Emory, midtown and downtown areas. Dogwood trees, magnolias and azaleas form the background for this picturesque town. Tucker is just what the suburbs are supposed to be. A quiet home just far enough from the fast-paced city, yet just minutes from all that Atlanta has to offer. Tucker offers excellent schools, convenient shopping and safe neighborhoods.Tucker primarily consists of 1960s and 1970s-era single story "ranch" style, split-level homes, and 1970s and 1980s-era multi-story homes. The latter two often feature daylight basements. A few newer communities have been developed though, so a variety of newer homes are also available here. Various neighborhoods are typically groups by geographic association with elementary schools and other centers of community life such as parks.